This crochet chevron blanket pattern creates a beautiful zig zag pattern consisting of peaks and valleys. Can be used as a blanket or bed scarf. In addition to the written pattern, there are photo tutorials, as well as, a video tutorial to help everyone be able to crochet this too. Look closely at this pattern and notice the details. There is almost a look of 3 D. This is achieved by crocheting in the back loop, using single crochet, and creating a zig zag pattern. Additionally, the yarn colors help create a country chic color pattern. The photo below helps show off the pattern illusion; however, take a look at the bed scarf photo too. The photo looks like the bed scarf is folded, but it is not. It is actually laying flat. Whenever I stay at a hotel, I love the beautiful bed scarves. When I was crocheting this chevron pattern, I initially thought it would be a beautiful country blanket. However, I spent a girl’s day out with my sister recently and we stayed at a hotel. I brought the blanket along with me to show my sister. We decided it would look beautiful as a bed scarf. A bed scarf is a blanket that is placed at the foot of a bed to protect a comforter or duvet from damage and dirt. Beds carves are often used in hotels. According to The Picket Fence’s Bedding Glossary . A throw is a small, thin blanket used for layering on a bed. Often only large enough to accommodate a single person, a throw is typically used as decorative piece. 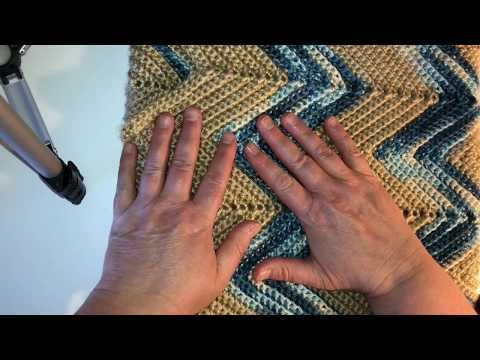 I think that this chevron crochet pattern can be used as a throw also. In this pattern, the peaks are formed by working three SC into one stitch. The valleys are formed by skipping over 2 stitches. In my chevron crochet pattern, I worked 13 SC up and down each side. Therefore, one peak is 29 stitches. Here are how the 29 stitches are calculated. There are 13 stitches on each side and 3 extra stitches at the top (13 + 13 + 3 = 29). What does SC2TOG mean? Single Crochet Two Together. The SC2TOG is used at the beginning and end of each row. SC2TOG Alternative in this crochet pattern. If you would prefer not to complete the SC2TOG, you can skip the second to the last single crochet and complete a single crochet in the last stitch. Whichever way you prefer to decrease the ends is fine. Either way will get great results. Near the bottom there is a video of this pattern being worked. For those folks that would rather follow a photo tutorial, that is there for you too. It is my hope that you are able to master this pattern. Finished blanket size is approximately 30 inches wide by 56 inches long. Six Peaks. Pattern repeat is 29+3 if you would like it larger or smaller, multiply the number of peaks by 29, then add 3. Note: if you use a larger hook and thicker yarn, that will also change the size of this pattern. 3 skeins Caron Simply Soft in Bone or approximately 945 yards. If you can’t find this yarn locally, you can find that here. 4 skeins Loops & Threads Blue Moon or approximately 828 yards. If you can’t find the yarn locally, you can find that here. Row 1: In the second chain from the hook and the next chain, SC2TOG. (single crochet the first to chains together), *SC in the next 13 chains, work 3 SC into the next chain, SC in the next 13 chains, skip 2 chains. Repeat between the * When working the last row of 13 chains, there should be two extra stitches. SC2TOG, these last two stitches. chain 1 and turn. Row 2 and on: From this row on, complete your stitches in the Back Loop; if you want to achieve the same look of this chevron crochet blanket. Start this row and each one after this with SC2TOG. (single crochet the first to chains together), *SC in the next 13 chains, work 3 SC into the next chain (this should be the middle ST of the 2 SC that was completed in the row before), SC in the next 13 chains, skip 2 chains. Repeat between the * When working the last row of 13 chains, there should be two extra stitches. SC2TOG, these last two stitches. chain 1 and turn. I changed colors every 10 rows in this sample, but it is your choice. My pattern was started and ended with the Caron Simply Soft Bone. Always remember to SC2TOG when you end a row and start a row. Always skip two stitches for a valley, always work 13 up each side. Always work 3 SC into one stitch for the peak. Always chain 1 and turn. That’s all a crochet chevron blanket pattern is! I hope that you liked this pattern. If you are looking for more ideas for crocheted projects, here are a few others you may enjoy.